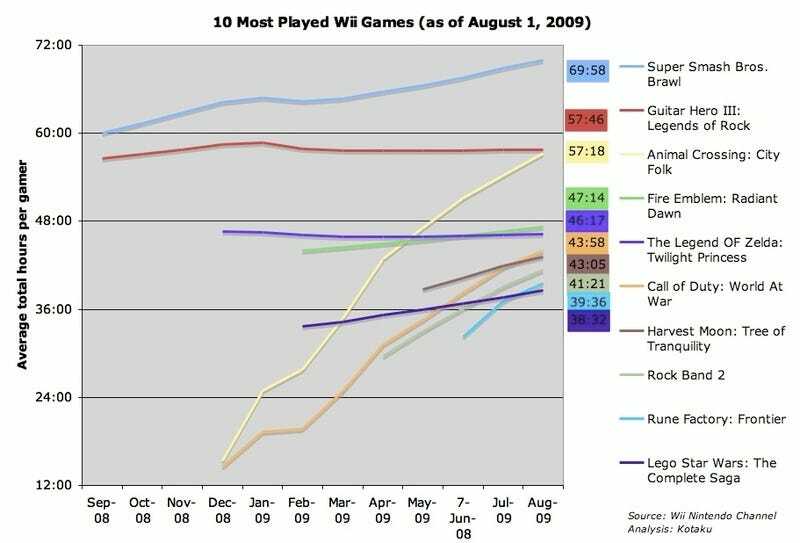 One month after Kotaku's last Wii stats report, here are the 10 games that get the most play by their owners/renters on the Wii. As always, note that this is NOT a list of the most popular games on the Wii. It's neither a rank of the best-reviewed games nor the biggest-selling. This monthly report is a study of the games that — once they are owned or rented — get played the most. Think of this as a way of finding out which games prove to be most worth the money spent on them. Or think of is as a chart of the games that most pleased those who popped them into their Wii. And when you look at it that way, you've got to respect the impressive rise of Call of Duty: World At War. Some readers of this site thought it strange that I kept asking Activision what the plans would be for the CoD franchise on Wii this year. Earlier this week we broke the news of what those Call of Duty Wii 2009 plans are. And do you see why I was asking? That million-seller, powered by online multiplayer, continues to average a high number of hours for its users. -The flattening of Guitar Hero play times vs. the rising play times of Rock Band 2. -The impending rise of Animal Crossing to the second most-played game on the system... Can it catch Smash Bros? -The, in my mind, inexplicable continued rise of Fire Emblem. I get that people like this solo-only game. I do too. But other solo-only games, like Zelda aren't rising at the same rate. Any theories? No new titles cracked the top 10 this month. Where's all this from? (AKA an explanation of the above chart for stat junkies only): In a move somewhat surprising for the generally secretive company, Nintendo makes all of this data public. Any Wii owner can download the Nintendo Channel to their Wii and begin browsing for games. Any game that has been played enough times has usage stats listed for it, contributed by anyone who chose to share their data with the channel. The sample size that the channel tracks is pretty good. We calculate it by looking at Wii Sports usage numbers, which show that more than 72.5 million sessions of that game have been played by Nintendo Channel users (up 3.5 million in the last month), for an average of 28.92 sessions per player. That divides to more than 2.5 million Wii Sports users whose gaming has been tracked by the channel. Since almost all Wii Sports owners would be Wii users, we will venture that as many as 2.5 million people are contributing stats. That is up from 2.4 million people when these numbers were ran for July 1.